Just when you thought the plants had won for good, it turns out the zombies were merely regrouping for a renewed invasion. Plants vs. Zombies has long been a cornerstone of casual mobile gaming, garnering the attention of mobile gamers for its unique and fresh spin on the tower defence genre, not to mention its quaint humour. It was enough to get its maker, PopCap Games, acquired by gaming stalwart Electronic Arts (Nasdaq: EA) last year in a deal worth as much as US$1.3 billion if PopCap performed well. That was after social-gaming slumlord Zynga (Nasdaq: ZNGA) lost out on the bidding war with its offer of US$1 billion in cash. 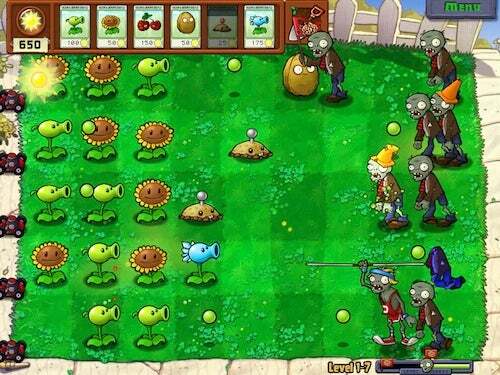 Plants vs. Zombies. Source: PopCap Games. The sequel will include new features and game environments, and PopCap says the franchise has “tens of millions of fans around the world.” With as popular as this franchise is, I’m honestly shocked that Zynga hasn’t tried to rip it off yet. EA hasn’t disclosed specific revenue figures for PopCap, but chances are this acquisition was largely successful considering the brand strength its games enjoy, including Bejeweled, which is now on its third iteration and sells a copy every 4 seconds. In contrast, Zynga’s largest single acquisition to date, OMGPOP, has been a disappointment by its own admission. The plants won the first round, but zombies aren’t a bunch known for their ability to stay dead, which is good news for EA.